oh, oh OH am I ever unamused at the moment. What have they done to this poor yogurt? do they let it spoil before they freeze it? I was ready to chalk the one from Walmart up as a fluke, but this one is from Stop & Shop and just as bad. My word, what have they done???? Such a waste because they sound so good: Raspberry frozen yogurt with white chocolate flavored chips. Disclaimer: Apparently there is a trend towards "TART" yogurts, and I'm probably being too harsh, but to me, it has an unpleasant consistency and strikes me as spoiled, not tart. I'm sorry but I have to totally disagree!! I saw one in the ice cream section of Walmart and knowing I like Raspberry and love White Chocolate, I figured for $1 how much risk could there really be. I fell in love at the first bite! I thought the flavor was delicious and those little tidbits of white chocolate were the teaser on the top. On my next trip to Walmart I stocked up on more. Only saw the one flavor my first trip but discovered Cookie Dough this last time. Cant wait to give it a whirl. I am fan of Kemp's Frozen Yogurt Parfait White Chocolate Raspberry I stopped to get something and noticed a sign which stated the now were serving kemps frozen so I ordered one and I enjoyed it so much I am on line doing a search to find out where I can find it and I know now that Walmart has it I will be making a trip this weekend to stock up on it. I have a confession to make because I was unaware of where I could purchase this product I stopped a Swan driver asking if they sold this yogurt needless to say they didnt but because their products are of great quality I did buy a pint of their yogurt but walmart here I come.Keep making your frozen yogurt Kemp its mmmm mmmm good. 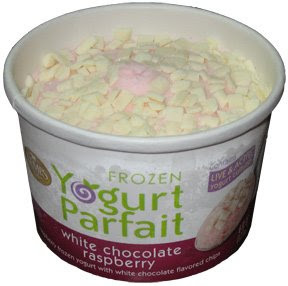 I like the tart frozen yogurt, so maybe that's why I don't hate these yogurt parfaits. The white chocolate raspberry is not my favorite, but I don't hate it. My favorite is unquestionably the mango peach. It's really good.